It is fair to say that Alex Iwobi has his critics among the Arsenal faithful. He was only six weeks old when England beat the mighty Oranje in 1996 (4-1) and that tells you how young he still is. Yet there really are already more than a handful of Gunners who want him sold! They have seen enough, they tell me. Everybody is entitled to have an opinion, of course, but come on: give the boy a chance!! Yesterday, Alex was voted Player of the Match by the fans, and quite rightly so (see link above). The Super Eagles were played off the pitch by the Three Lions in the first half, but Alex was the only one who dealt well with the impressive press that was applied by the home team. He constantly held on to the ball and made space for himself without it and with it. He then found a fellow player in enough space to pass the ball to regularly, and thus start an attack from beating the press. I was less impressed by Iwobi’s fellow midfielders who often lost the ball when the slightest bit of pressure was applied to them, which then left the defenders exposed time and again. England scored twice and should have scored more goals as they outclassed Nigeria completely during the first half. However, Gernot Rohr did a fab job in making tactical changes – three at the back and four substitutions – and getting his team re-focused for the second half, whilst England’s boys clearly felt they had done enough in the first half and/or were unable to respond adequately to Nigeria’s changes. The Super Eagles scored within two minutes and then their wing-tales were up, the away crowd were behind them even more and the midfield was dominated by the visitors till the end of the game. It was Iwobi who set up the deadly attack with a fine ball to Ighalo from the centre of midfield; the former Watford striker hit the post with his precise diagonal strike and he was unlucky not to score; but the ball bounced back towards the ‘D-area’ and there was Alex to calmly steer it past defenders and keeper to score a fine, Ramseyesque goal. Alex kept making himself available and linked up the midfield with attack constantly. At the end he tired and he may have picked up a small injury, but Rohr was not going to sub his best player – one of only five players who played the whole game. I thought that last season was going to be ‘the’ big season for Iwobi, so maybe TA, I was 12 months ahead in my prediction? 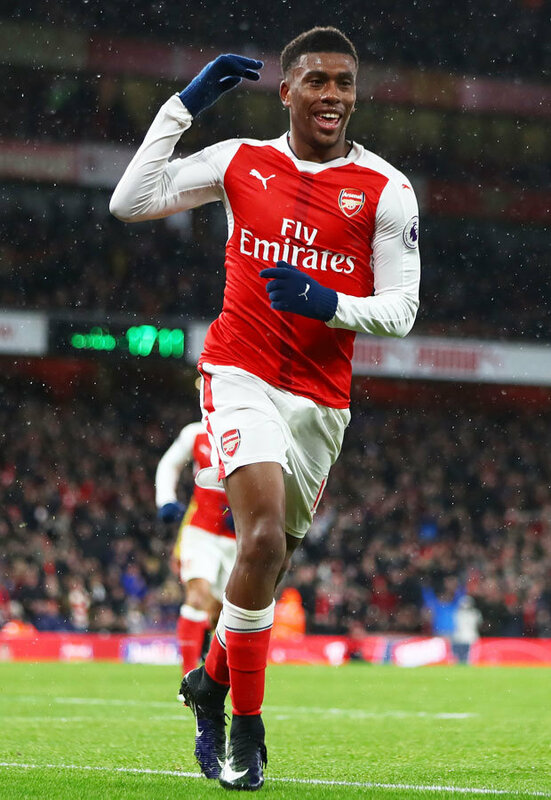 Iwobi played as if he had a point to prove TA, if he could replicate that form every week he’d be one of the first names on the team sheet. But at Arsenal he has to contend with big names like Ozil, Mkhitaryan, Xhaka, Ramsey and Wilshere, for Nigeria he looks confident and a leader. Confidence seems a bit of an issue, for Nigeria he plays as if he belongs in the starting XI and the fans love him. For Arsenal he plays as if he is constantly needing to show that he deserves a place in the team whilst the fans are not that enthusiastic about him. The transfer business the club/Unai does could well influence where he’s gonna be at, in another 12 months time? Agree completely….his ability to beat a man and/or retain possession under pressure is simply top class. Frankly, my hope is that Emery can give his self belief a boost and take him to the next level in terms of consistent end product. Lovely bit of work to create a chance, then finish his own when it came. If we see the first half, he could not do much. It was the tactical changes that did wonders to the whole Nigeria team. He was clearly better in the centre midfield compared to the right side, as it meant that he have to only focus on distributing the ball forward. The pressure in the first half was more severe compared to the second half, and if it was a more clinical team Nigeria would have been torn to shreds. So, I stick to my word that he is not a defense-minded player, and it is best that he gets redeployed to the AM role to suit Emery’s formation. Anyone in the UK I believe can watch arsenal legends v real,madrid legends for free on Arsenal,player. Kicked off about 25 minutes ago. I swear I would recognise Robert Pires tuning style anywhere. My voice is too feeble to carry a sound it seems but I’d keep at it that Iwobi is Arsenal’s best ball carrier, heir to Rosicky. He very much needs to improve on the defensive aspect of his game (which Emery hopefully can do) after which he’d be a joy to watch in the middle of the park. Then he’d be pushed deeper into the midfield ferrying the ball across for us with authority. His pass success rate (where he gets a lot of stick) at 86.6% is behind only Elneny and Xhaka for our MFders. Ahead of Ozil (whoscored! There must be a reason why he started 22 games plus 4 sub appearances. Another strange one for me is the vitriol against Mustafi. Well he happens to be in Whoscored Europe team of the season. There’s no way Whoscored can be that wrong. Whoscored is a robot with no prejudices. Good to see a rare visit from the language virtuoso, Sharkey. Seventeenho, another language virtuoso, is making some good music offerings. I would go with something classical, something from Dvorak or Bruckner, but anything Neil Diamond would also be ok. Agreed with your vision per Iwobi. I’d thought this morning how much better he seems to perform centrally– than when pushed out wide. Not dissimilar to how Ramsey’s game changes when he plays for Wales. Though Ramsey, with more experience, adapts well (if grudgingly!) when asked to play wider (versus deeper). Very keen to see how Iwobi progresses; hopefully quickly. Alex has grown into a man’s body physically these past two seasons. He is now an imposing physical footballer. Sometimes it takes time for a player whose relied on more finesse– to become more physical. But he is blessed with athleticism and talent. Here’s hoping he takes a next huge step this season. Mulling Mustafi’s All-Europe rating from Whoscored’s Mr Roboto? Apparently Mr Roboto isn’t equipped with eyes. You can make stats give off any result you wish. I often use them. But no avalanche of numbers can persuade me to ignore what my own eyes see. There are times when Mustafi can be the best– and the worst. For me there’s no place in my defense for a player who can give away a game. United, Newcastle, Atletico roll from the memory without having to think too deeply. It’s not vitriol when the case can be made. Simply prefer we try other options, than risk more of the same. jw, Newcastle was his (Musti) poorest game but it’s only fair to factor in the fact that he was one of the few players that played in Moscow Thursday, got back to London Friday 5am, took the trip to Newcastle to play again Sunday. No doubt, 2 errors in a season that lead to goals is bad enough but not enough to nullify all his positives to the team. Despite his tough looking personality, it seems to me he’s the type who needs support to be at his best. We should go easy on him. Atm, he’s the best defender of the four we have. No way we’d recruit 2 top CDs this window. You like your Mustafi stats. But relying on that 2-errors-for-goals is fool’s gold. For instance, the 3rd goal vs United (in that DeGea-is-a-demigod performance) is a great example. Alexis has come deep to re-win the ball and is bringing it up the far sideline. He tries the chip pass over and down the line — but hits the defender smack in the forehead. The ball caroms back over Sanchez. Several yards behind Alexis (in a spot where the LB or WB could be expected), probably 20-yards out of his (3-back) CB position– is Mustafi –who freezes– as the ball dances past his feet. The ball is taken off him– Pogba charges toward goal unabated, laying off to Lingard (where an in-position Mustafi might have been helpful) scoring his second (gifted) goal sealing the match. There are more. Where he switched off, was out-of-position, or left his feet needlessly, abandoning fellow defenders or leaving Cech exposed. Some describe Mustafi’s style as ‘high-risk, high-reward’. What reward, from this style– makes poor decision-making, at critical moments tolerable? Bottom-line is going to be? Whether SIR think he can be reprogrammed. Whether they are willing to risk their project– on a high-risk defender– coming off a low-reward season. D. Now go get some carpet cleaner …. Boy don’t you know you’ll be a Gunner soon! jw, …. your analysis of Manu 3rd goal might be spot on but then there is always somebody responsible for any goal conceded by any team. Over 1000 goals in the PL alone. I also imagine that the scientifically base statistical units as reputable as WhoScored and Squawka PPS take all those details and more into consideration. Of course they can’t be objectively perfect but am minded to give their facts and conclusions a good consideration. Mustafi in WhoScored Europe team of the season warrants a second look at his performance. Sure that you and I could continue down this Mustafi-rabbit hole for some time. Also of note? Is the process for coding video that Arsenal’s StatDNA employs to evaluate progression/regression projections of individuals. To the best of my knowledge– it’s the most detailed system in play at present. Supposedly Whoscored/Squwaka/Opta use a commercially available system which takes approximately 2 hours to code match video. While StatDNA’s detail runs much deeper with up to 14 hours to video code a match. This one aspect is the reason why I believe the club’s system may only now be reaching maturity (or even a year on from now). SIR likely have mature data on existing players. So what I’d mentioned earlier could be a litmus for StatDNA IMHO. In whether SIR keeps Mustafi or flips him. Was born in Pontiac. Family lived in Dearborn for years before I was born. Did you know: Neil Diamond wrote most of the music for The Monkees? Rabbit hole it is jw. Maybe am allowing the machines to take me over.